The ‘invited buyer’ format of Exclusively Housewares and Exclusively Electrical has delivered a strong visitor profile for exhibitors once again, with buyers from major high-street names and online giants, as well as international retailers. 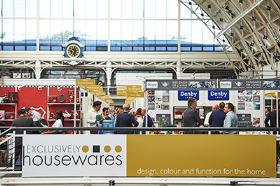 “Senior, quality buyers from across all the different retail categories attended the shows this year,” show director Simon Boyd said of the Exclusively shows, which ran last week on June 13-14 at the Business Design Centre in London. Organised by Brooke House Exhibitions, Exclusively Housewares & Exclusively Electrical vet all their visitors carefully, inviting only bona fide housewares, tablewares and SDA buyers to attend the shows. The strategy meant that, this year, buyers from major high-street names The Range, TK Maxx, Argos, Robert Dyas, Marks & Spencer, Lakeland and Steamer Trading all attended. Out of town retailers, Leekes, Dunelm and Dixons Carphone were also represented by buyers at the show. The grocery sector saw teams from Sainsbury’s, Morrisons, Tesco and Asda attend, whilst department store visitors included John Lewis, House of Fraser, Debenhams, Selfridges, Brown Thomas, Barnitts, Dinghams, Rossiters, Jarrolds, Bentalls of Kingston and several different Fenwick stores. Exhibitors also welcomed buyers from a wide range of e-commerce/mail order companies, including Amazon, Achica, Brand Alley, Next Online, Kaleidoscope, Freemans, JD Williams, Express Gifts, Wayfair, Harts of Stur, Shop Direct, Ocado, QVC and Ideal World. In addition, buying groups, such as Sirius and Euronics attended Exclusively Electrical, along with BIRA Direct and AIS. In the wholesale/cash & carry sector, exhibitors saw buyers from Decco, Costco, Jegs Electrical, Stax, EFG and Home Hardware and garden centre visitors included Bents, Wyevale, Blue Diamond and Haskins. The shows invited group of international buyers also drew praise from exhibitors, all of whom are given the opportunity to meet the buyers in a separate networking event held the evening before the shows open. Heavyweight retailers from as far afield as Australia, Poland, Latvia, the Czech Republic and Hong Kong, as well as Scandinavia and Europe, all visited the shows this year. The international line-up includes recommendations from the Housewares Committee at the British Home Enhancement Trade Association (BHETA), which works closely with the shows to ensure visitor contacts are kept up to date. Visitors were treated to new features at the show, including a comprehensive trend display co-ordinated by trend forecasters Scarlet Opus and sponsored by BHETA. The team has worked with the shows for several years to help make suppliers and visitors aware of the consumer and design trends affecting the housewares sector, and how they can make the most of them. Trend Tours of the shows were also available for visitors. BHETA sponsored a seminar programme, run in the shows’ new Tomorrow’s Kitchen feature, which was well attended over the two days. In 2018 Exclusively Housewares and Exclusively Electrical will run on June 12-13 at the Business Design Centre, London.